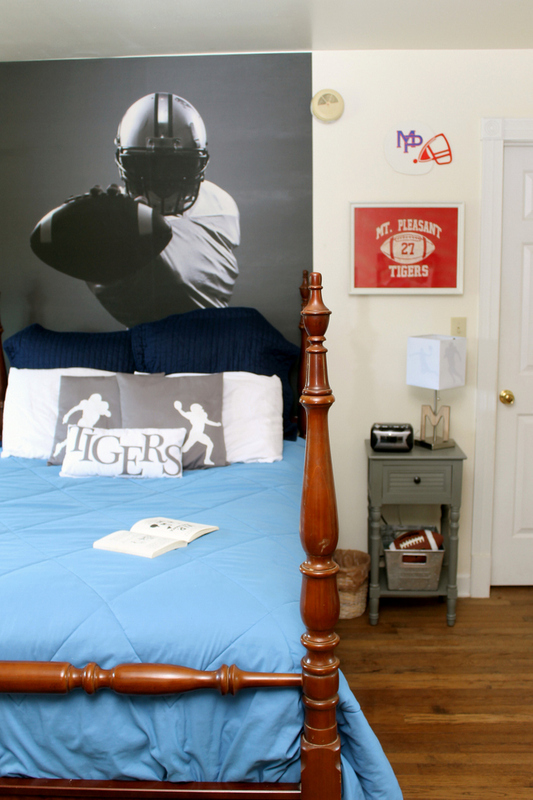 A sports themed room is perfect for kids of all ages. I found however that my son’s room needed a little upgrade to help it grow with him into those pre-teen years. 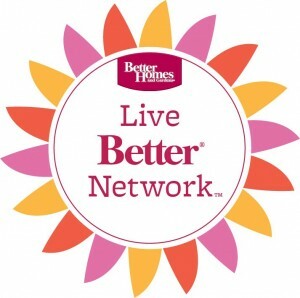 I was thrilled when this month’s sponsored post for Better Homes and Gardens involved an easy decor makeover. I knew that I could just add a few pieces to make his room feel a bit more grown up. Please note that links may be affiliate links which means you do not pay anymore but a portion of your purchase goes to support this site. I actually started this project a while back and made slow, small changes over a few months. An easy way to make a big impact on a small budget is to tackle a room over a few months. Buy a few things here and there when you can and layer those in. In the end, you will have a room that looks so different! 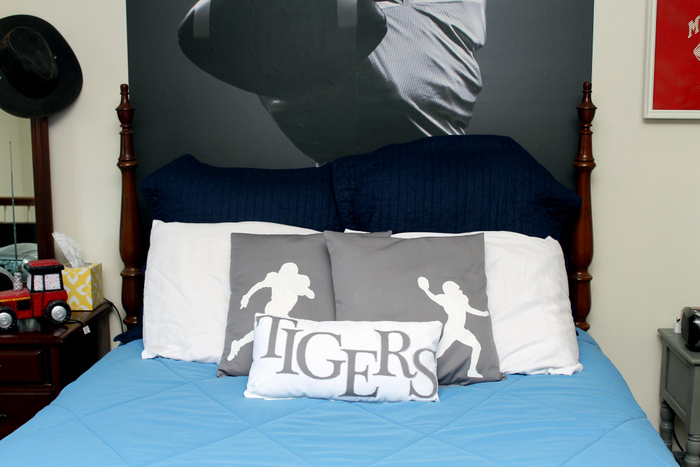 I started with that football wall mural then added on those football silhouette pillows. I picked up the large Euro pillows and two of the Better Homes and Gardens Solid Cotton Euro Shams . Those big pillows really helped as his headboard is a bit small. Want to give your bedroom some impact without replacing the headboard? These will do it for you! The comforter was actually a purchase from years ago and it is reversible. We turned it to the lighter blue side but needed to change up the bed skirt. This navy skirt came from my local Walmart store. 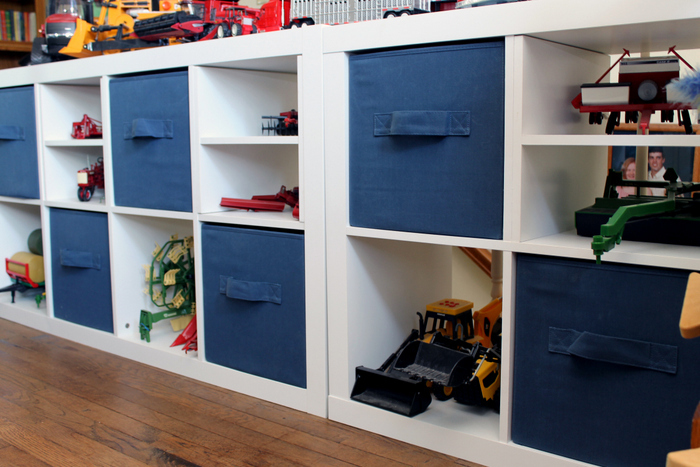 You can also click here to see more about our under the bed toy storage. 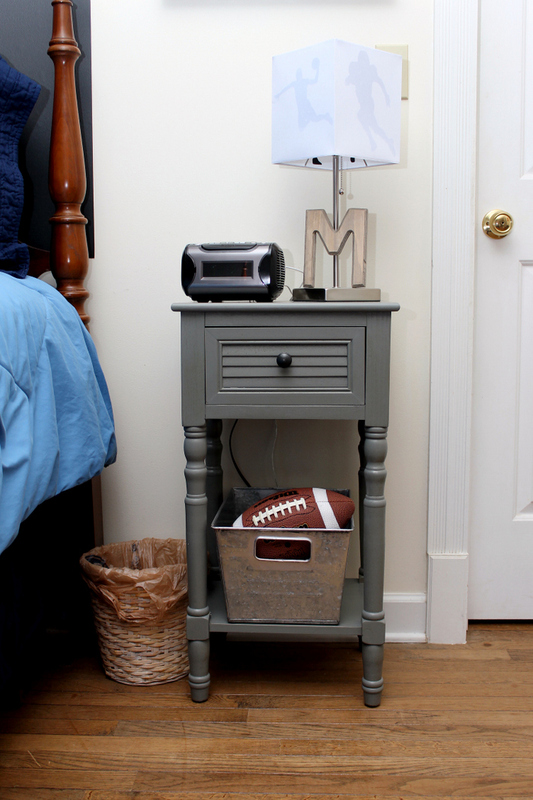 You may notice that amazing night stand next to the bed! That is the Better Homes and Gardens Shutter Accent Table . I love that color and those details. I fell in love with this one online and in person it did not disappoint. Adding a new nightstand to this bedroom made all of the difference in the world. It is funny how such a small change can have a huge impact. 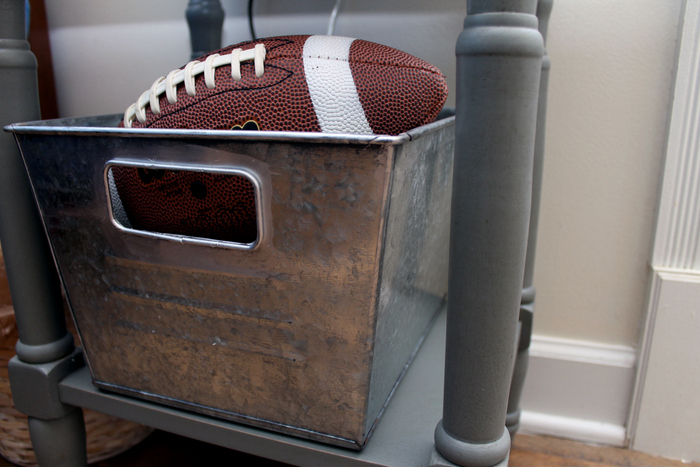 The bottom shelf of the table holds a Better Homes and Gardens Small Galvanized Bin . I added a few farmhouse touches to the already slightly rustic room so one of these galvanized bins had to make an appearance. These are one of my favorite products and they are slowly making their way into every room of my home. 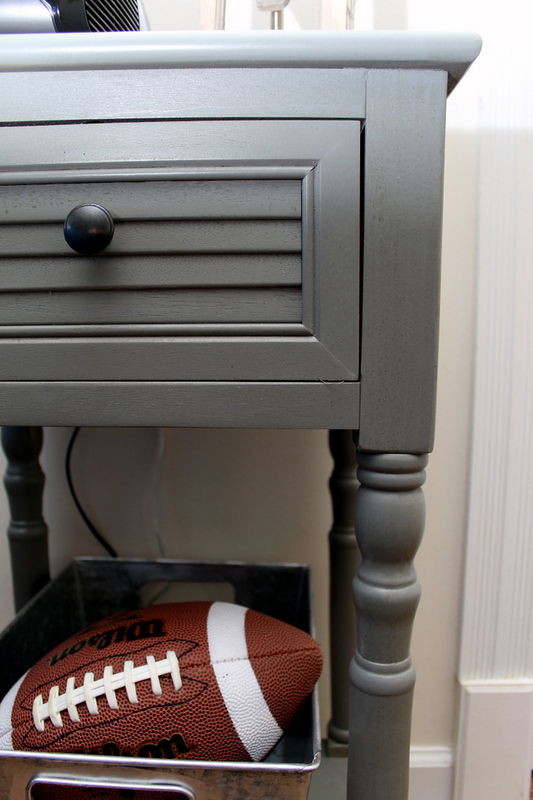 Even a sports themed room needs a farmhouse touch! The top of the table holds the DIY sports lamp. You will just have to click here to see more about that lamp as well as a picture of it on! 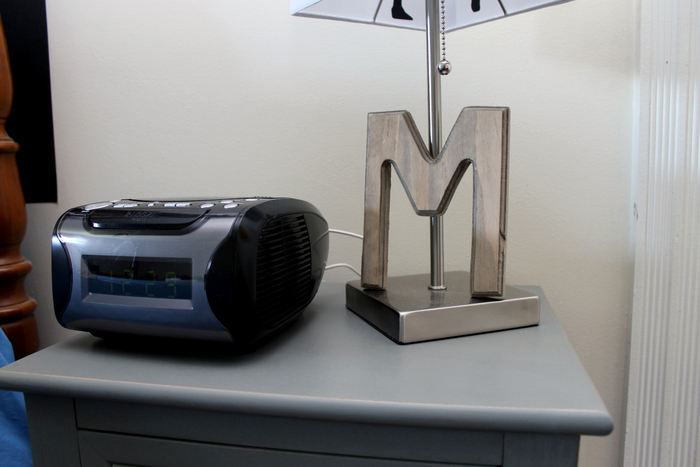 I also added on a monogram and we picked up a new alarm clock from Wal-Mart that will make any pre-teen boy happy. 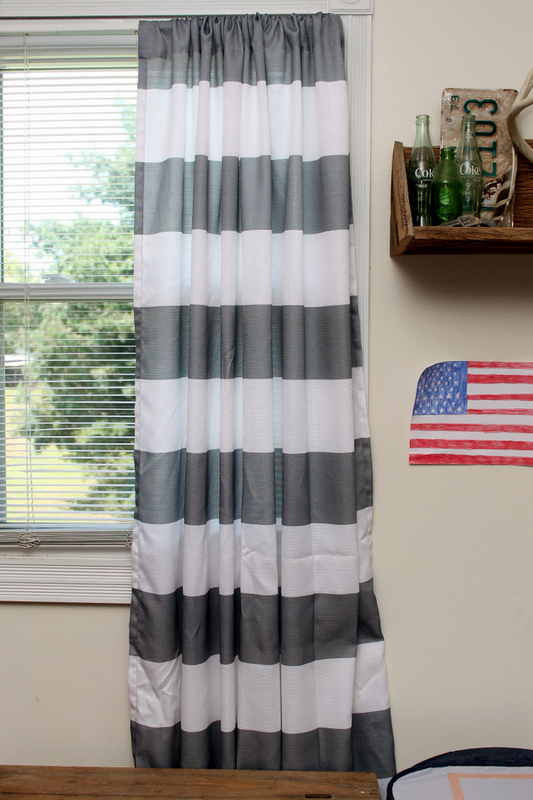 Another way to change up the look of a room in minutes is to add new curtains. 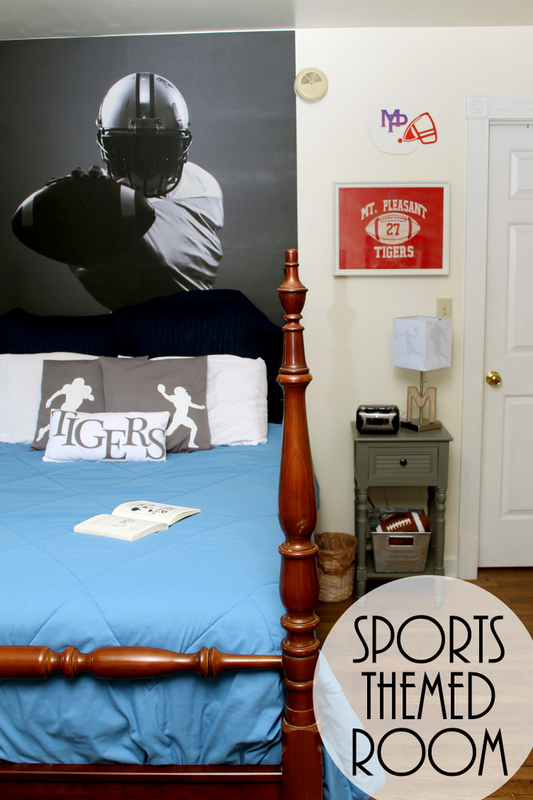 I fell in love with the Better Homes and Gardens Stripes Panel and picked up two of them for this sports themed room. These will work in so many spaces! I may just have to pick up a few more pair. 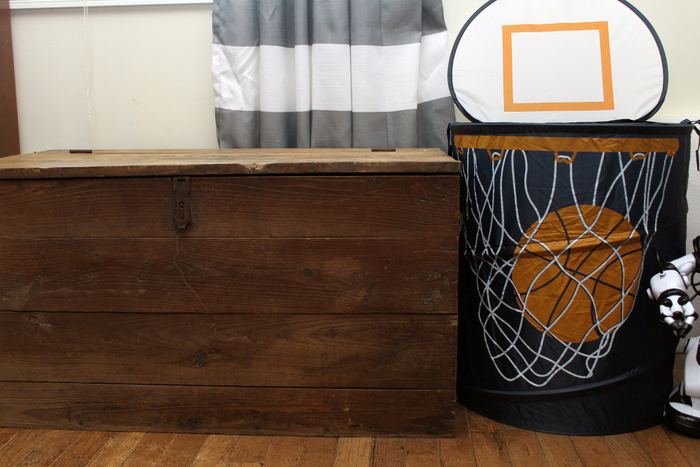 Under the window sits a vintage tool box that we found years ago along with a basketball hamper from Walmart. 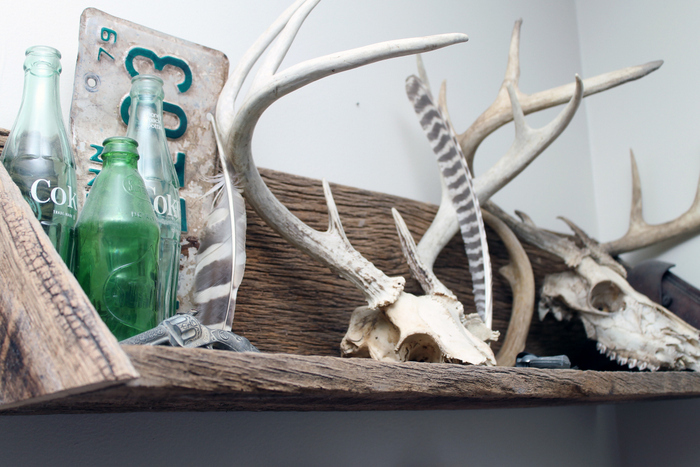 Next to the window is the barn wood shelf that we made years ago. The collection on this shelf changes over time and as my son grows. This is also the room where I added the cube toy storage. It is still working great and is perfect for this space. Sometimes small changes can have a big impact on any room. Try changing up pillows and curtains like we did here for an entirely new look. Want to take it a step further? Add a new piece of furniture or rearrange pieces already in your home. Slowly change the look of a room over time for a new look on a budget. Whether you are working on a sports themed room like me or another room in your home, these tips and tricks will help you to make your home stand out! 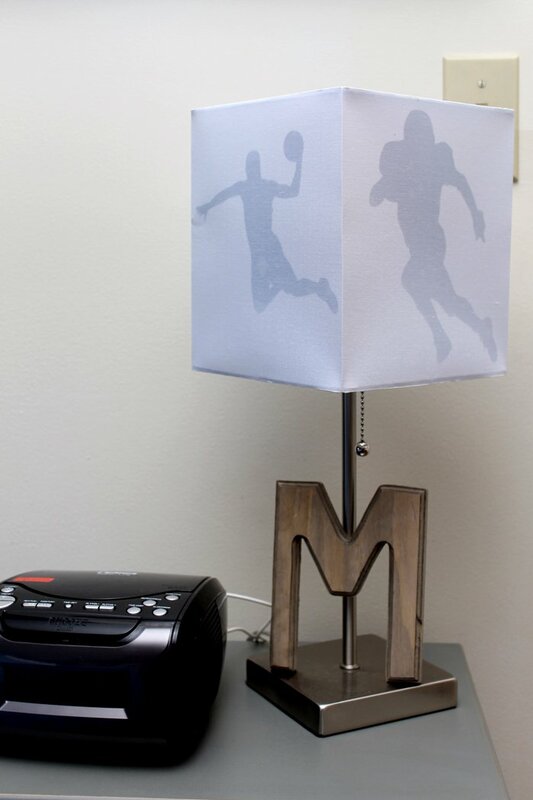 previous post: DIY Sports Lamp in Minutes! Your project gave me inspiration to finish my boys rooms!!! Thank You! I featured you on A Little Bird Told Me Link Party!! !